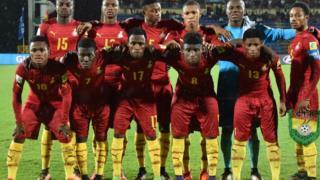 Di captain of Ghana U-17 team, Eric Ayiah say make Ghanaians forgive di team, after dem crash comot di FIFA U-17 World Cup for India; dis na according to Ghana News Agency. Di Black Starlets suffer 2-1 defeat from dia West African neighbours Mali for di quarter final stage of di competition. Ayiah talk dis one for interview say as dem take waka no be only di team feel sad, but di whole country, and im dey sorry. "Di game against Mali no easy … we no plan to lose but na football we try and we for like qualify." "We know di kain support we get from our country and wetin I fit talk on behalf of di team, na say make dem no dey disappointed in us; make dem forgive us, pray for us to do better for future for di country," na wetin im talk. Di Black Starlets don lose to Mali three times for 2017 - for di African U-17 championship for Gabon wey end 1-0 and for friendly match for Dubai wey end with scores of 2-1.